I don’t always have time to make a time consuming dinner. On days like that, I look for quick and easy meals to make. Dinner is ready in twenty minutes with this Twenty Minute Easy Tortellini Bake. Pastaholic. Is that a word? Perhaps a made up word. Made up by me. I’ve called myself a pastaholic before. I love pasta. I can gobble it up even when it’s unseasoned and straight out of the pot. This is one of the reasons that I have to exercise. Between pasta and cookies, if I didn’t exercise, I’d be pretty miserable. Not that I live off of pasta and cookies. I don’t eat them everyday. But I’ll admit, I can get a little out of control when there are pasta dishes around. And cookies? Forget about a ton of control with those. Cookies are by far my biggest sweets weakness! What’s yours? Some of my favorite pasta dishes include dishes with red sauce or cheese sauce. O.M.G. Have I told you how big of a sucker I am for macaroni and cheese? You could set up a lab in my kitchen and I could conduct macaroni and cheese experiments. YES! Experiments with different macaroni and cheese flavors (type of cheese, addition or meat or veggies, different seasonings and peppers,) I’m down with that! I like to experiment with easy pasta recipes as well. That’s how I developed the recipe I’m sharing today. I mixed some frozen cheese tortellini with my Slow Cooker Spaghetti Sauce and topped it with mozzarella and parmesan cheese. Shut the front door. Seriously, it was really that simple! Serve with a garden salad or ceaser salad and garlic bread for a complete meal! Cook the tortellini according to package directions, about 8-10 minutes. 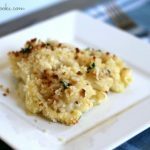 Place in a 1 1/2 qt baking dish and top with shredded mozzarella cheese and parmesan cheese. Bake at 350 for 8-10 minutes. During the last couple of minutes, turn on your broiler so the cheese gets slightly browned. Remember, if you don’t have time to cook, make this recipe! Your family will love you. Your stomach will too! 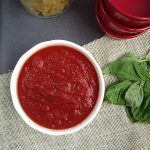 A perfect use for your homemade sauce! Oh holy yum, I’m a pastaholic too! Love all that cheese stringing along! Wonderful pictures Julie! Julie, I am totally SWOONING over this bake! I am a pastaholic as well and nothing makes me happier than a giant plate of pasta with gooey melted cheese. I am pinning this and cannot wait to try it! That is so EASY!!! And yummy. All that cheeseeeeeeeee. Pinned!! This looks so cheesy and DELICIOUS, Julie. I’m pinning this for those busy nights…or just any old night. This would be good any time! It’s so easy! You should definitely try it. I really like the Butoni refrigerated tortellini. It’s delicious! Wow, that look stunning Julie… I’m stunned! Love all that cheesy goodness going on here. Delicious! And you gotta love how quick it is to put together. Outstanding & pinning! This is a dinner saver, loving this! Thank you! This looks delicious! I wish you were scooping that right onto my plate in that last picture :) Pinned of course! Does peanut butter count as a sweet? ‘Cause that’s definitely my weakness. I could eat a full jar in one sitting! 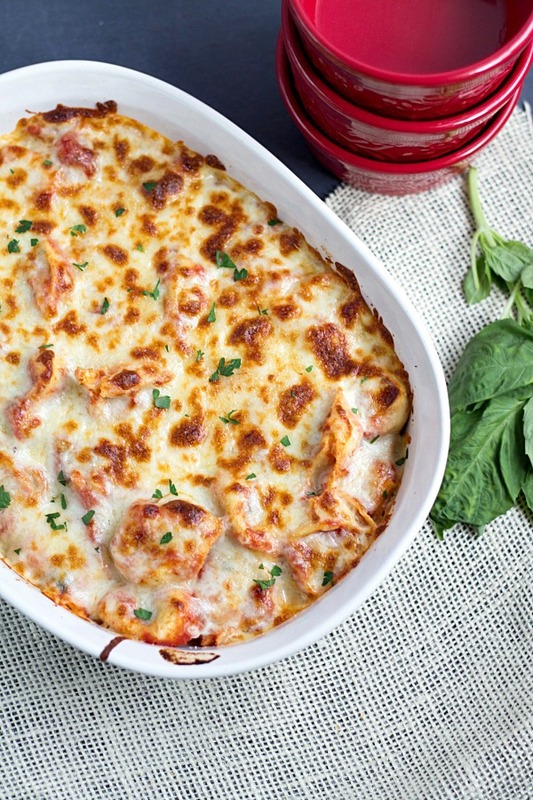 This tortellini bake looks delicious and very cheesy, yum! OMG. Peanut Butter. My other weakness! I can eat it right out of the jar too! Ha, I have a jar in my desk at work. :) Thanks so much for stopping by, Marie! Hi Julie- Your tortellini looks scrumptious! I eat peanut butter out of the jar, too. I love this brand, Better n Peanut Butter; slightly lower in sugar than my favorite Jif, and you can buy it in plain, banana, and chocolate. I was given 20 minutes to cook something, I don’t know if I can make something that looks this good, Julie! Love the cheesy tortellini! Having two kids around, this kind of meals save us during the weekdays! This looks so good, Julie! 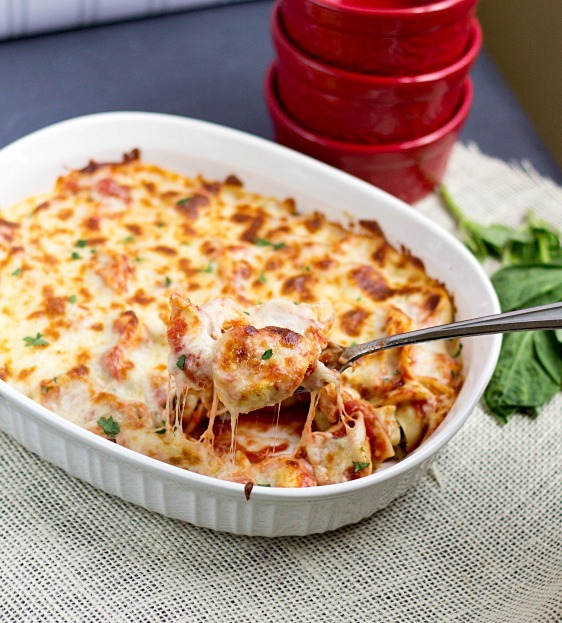 :) I love pasta dishes and casseroles- they can be thrown together so easily and quickly! Wow this looks soooo yummy! I pinned it and will be making it soon! Can you add ground beef to it too? Yes, you can add ground beef. I recommend 1/2lb to 1lb, depending on how meaty you want it to be. this is delicious JULIE,my husband likes it. I love this! tortellini is one of my favorite things! also…fast and quick dinners! Hi there! Thanks very much for this idea! I was actually looking for something I could make and serve at my staff luncheon. This looks awesome and delish! I am planning to double it….. Or else make 2 separate pans of it. Thanks again!! You’re very welcome, Sofia! I actually made this again for dinner last night. I was busy and didn’t get around to making dinner until after 7. We were eating dinner by 7:45! I hope you enjoy this and thanks for stopping by! made this tonight except with some sauteed veggies with it. sooo good! Thank you so much for letting me know you enjoyed this. I bet it was good with sauteed veggies! Found this on pinterest and made it for dinner tonight. Delicious!! 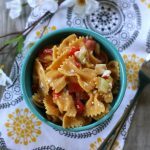 Quick, simple and oh so yummy! I love that you could easily make this for a quick meal if friends stop over without notice. Everything is usually on hand (especially if you use frozen tortellini). This will be a new regular for me! Thanks!! Wow – cheesy goodness! Yes please! thank you for the recipe lovely! This looks really good!! Do you think it would freeze well? I’m always wanting to try new things, or, at least, things new to me. I recently started blogging (which will also include food recipes I’ve actually attempted), and tonight for dinner, I wanted to try a chicken and tortellini bake. I stumbled on your recipe on Pinterest, and I will be using your recipe as a guide for my own (HA!) I’m sure it’ll be good. It may not be a pretty as your picture is, but it’ll definitely be up there. Chicken is marinating for it now! Can’t wait! Thanks! Pingback: Chicken and Cheese Tortellini – yes, a recipe. | It's Jason – From the Growling Couch! WOW! This looks phenomenal. Delicious tortellini blanketed with warm, melty cheese. SIGN ME UP! And it looks so easy to make. Great Recipe Julie Murkerson . I made it today for dinner. Yay! Glad you liked this recipe, Victor. Thanks for stopping by to let me know! This looks absolutely amazing!! I’m actually making this tonight for dinner. I’m going to add some shredded chicken to it. I can’t wait to try this…!! Awesome! So glad you enjoyed the recipe, Melissa! Thanks for the info, Tammy! I have seen the Dreamfields pasta at the stores but I have not tried it. Mmm! I’m going to make this tonight! You’re welcome, Jenna! Hope you enjoy it! I made this for dinner tonight. It was great. Thank you! Do you suppose I could skip boiling the tortellini first and just put them from the fridge into the dish into the oven and then cook it longer? I hate the hassle and extra dirty dishes of boiling pasta first. I can’t say for sure as I have never cooked the tortellini that way. But since the tortellini that I used is the refrigerated type that is already hydrated, think it could work. I’ll have to test that one day but if you give it a try, please do stop by to let me know if it worked! Were frozen or premade tortellini’s used? Pastaolic is bound to be a word because it describes me and my kids. This looks delicious! Thanks for sharing at Over the Moon. That looks so yummy and so easy to make. Pinned. I have to admit I never have made a pasta bake. But, yours looks delish! Thanks for sharing at the Inspiration Spotlight party. Pinned & Shared. I can’t imagine a better meal in only 20 minutes! Looks & sounds yummmmmy! Thanks for sharing with us at Funtastic Friday! 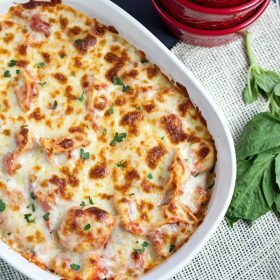 Your tortellini bake sounds so good I too love pasta and can’t wait to try it myself. Thank you for sharing at the Snickerdoodle Create~Bake~Make link party! What a nice and easy recipe! Perfect for weeknight dinners! I too am always on the lookout for quick and easy meals! The tortellini bake looks Delish! Thanks for bringing it to FF! Your Tortellini Bake looks delicious! I really appreciate you sharing with us at Full Plate Thursday, hope you have a great day and hope to see you again soon! Yum! This looks simple and delicious. Maybe, just maybe, my kids would even eat it! Ha! Pinned and sharing. Thank you for joining us at Family Joy Blog Link-Up Party last week. I hope you will join our next party starting Sunday at noon EST. I was told at church Sunday that this Sunday’s dinner is Italian dinner day. Didn’t want to make my spaghetti and came across the pre-stuffed pasta and am making this recipe for Sunday. Will let you know how it goes over. Thanks. We made this tonight but I added some ground meat . I also used my fresh graown tomatioes that we canned last year. I also make sundred tomato and motzarelli cheese bread. It was a hit! Thanks for the receipe. We made this tonight but I added some ground meat . I also used my fresh graown tomatioes that we canned last to make the sauce. I also made sundred tomato and motzarelli cheese bread. It was a hit! Thanks for the receipe. Looks very yummy And easy! !Thanks for the great recipes ,keep them coming!! This recipe looks so good! I’m definitely trying it. Thank you for sharing! Tortellini crab salad sounds great, Kathy! Making this currently. We are HUNGRY!!!! Shared with my readers and pointed them here for directons. Thanks for the recipe! Loved.the easy tortellini recipe! Made it tonight for my boyfriend and he loved it. I sliced and browned smoked sausage while the tortellini was cooking. Added it to the dish before baking and it was delicious!! Thank you so much for this easy and quick recipe! I am making this tonight for dinner. I am adding spicy Italian sausage to it. I think it will be delicious with the melty mozz. This looks so good!! Just wish your column was set up to be able to print just the recipe. Thank you! There is a print recipe button within the recipe card. I tested it and it works. Could you try again and let me know if it still doesn’t work for you? Amazing as written! I will often use a 5-cheese shredded Italian blend instead of mozzarella because I’m more likely to have that on hand. But it’s gotten to the point that I keep tortellini in my freezer and a jar of marinara in my cabinet at all times! This was very plain and wasnt too exciting to eat. It was easy and quick but I won’t make it again. I made this tonite & it’s in the oven right now. Can’t wait to taste! I also some steamed yellow squash to bulk it up for my husband. Made this tonight, and it was delicious! Have you ever cooked the tortellini and let it cool and refrigerated it and just thrown it in the oven at the last minute? Just wondering if I can prepare it ahead of time. Thank you. Some recipes have a nutritional breakdown but I don’t see one here. Is there one? This sounds good, quick, and easy, especially if a protein is added to the sauce. I am working on adding nutrition content to many of my recipes; however, I did not calculate calories for this recipe. You could use My Fitness Pal to calculate the nutrition content – that is what I use to calculate for my recipes. Hi, Julie! I’m going to try your recipe for the Tortellini Bake for the first time. It looks really delicious! I have 2 questions to ask you. When I watched the video, I noticed that you added something to the water before cooking the tortellini and I’m not sure what it was. 2) If I decide to add some ground chicken to it, do I cook it first? I appreciate your answers and I look forward to making your tortellini bake! Thank you! I loved this recipe. It was delicious, quick and easy. Just what I needed for tonight! I did mine with smoked sausage and Alfredo sauce. Taste great. My kids loved it.